There are a lot of things to look for when you want to find the best rabbit bedding. Of course, you want it to be soft and comfortable for your rabbit’s feet. It should also be light enough to encourage your pet to play and burrow. Using bedding that absorbs moisture and liquid waste while still controlling odor is important. So is choosing one that doesn’t have a lot of dust as it can cause breathing or allergy problems for someone living in your home or even the rabbit itself. The last thing to take into consideration is whether or not the material is all natural. All natural bedding is a safe choice that is great for your pet as well as being friendly to the environment. Let’s take a look at some of the best bedding for rabbits available. What is the Best Bedding for Indoor Rabbits? There are a lot of great options when it comes to rabbit bedding. We did our research and found some of the best ones out there. Our first pick for best rabbit bedding is this soft paper bedding from Small Pet Select. 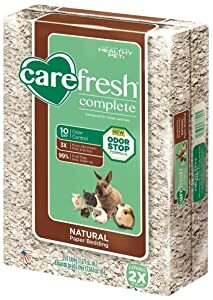 This bedding is 100% natural and is great for rabbits as well as hamsters, chinchillas, guinea pigs, and any other small animals. One of the best things about this bedding is that it’s 100% natural. It’s made of unbleached paper which is softer than some other kinds of bedding and won’t irritate a rabbit’s delicate paws. Plus, because it’s not pellets or sand, it creates minimal mess. This product was developed by pet owners who were looking for something that was gentler on their guinea pig’s little feet. Because they found that all the available bedding was too hard or sent up too much dust, they decided to develop their own. The result is bedding that’s perfect for rabbits. It’s comfortable for their feet and won’t send up any dust that’s harmful if inhaled. Plus, it’s really absorbent. In fact, it expands up to 3 times in volume from what you get in the package. Our next item is from Carefresh. This bedding is all natural and made from reclaimed pulp. It’s free of inks, dyes, and chemicals and is one of the healthiest beddings available for your pet rabbit. They do a lot to make sure this bedding is safe. First, they process the pulp to remove any dangerous oils and hydrocarbons from the pine and cedar. Then, they test for any contaminants and heat it to 380 degrees F to kill any bacteria, mold, or fungus that might be lurking. This bedding absorbs three times its weight in liquids and helps control any odors coming from pet waste. It inhibits ammonia from forming, which is the primary chemical that creates an odor in pet urine. It clean, healthy, and 99% dust-free. This Clean & Cozy bedding is perfect for rabbits and other small animals. It’s made from recycled hygienic products and is good for your pet and the environment. There are no harmful chemicals or by-products. This bedding is super-soft and won’t stain your rabbit’s fur or cage. 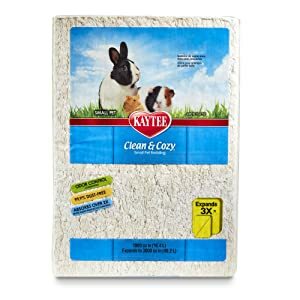 The soft and fluffy texture encourages rabbits to dig and burro plus it is twice as absorbent as wood shavings. In fact, it absorbs up to three times its weight in liquid. Because it’s so absorbent, it helps control odor. It even has an odor control guarantee. We also like that this bedding is 99% dust-free. That means a cleaner and healthier space for a pet rabbit as well as less mess and clean up for owners. For great bedding that absorbs moisture and controls odor, check out this crumble bedding from Vitakraft. It keeps your rabbits home dry and comfortable by quickly absorbing waste and is effective for up to 14 days. It keeps both your home and your rabbit’s home odor free with minimal bedding changes, which means less work for you. This bedding is made of 100% clean, unbleached, recycled paper. It’s soft crumbled shape is comfortable for your rabbit’s feet and absorbs up to three times its weight in liquid. Not only that but it also produces less dust for easier cleanup. 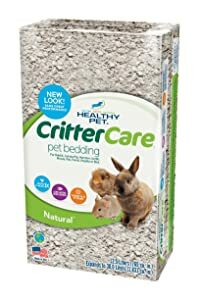 The Critter Care bedding from Healthy Pet is able to expand to twice its volume and absorbs three times its weight in moisture. In fact, this 12.5-liter package expands to as much as 30 liters! This bedding also provides effective odor control by specifically working to suppress the strong ammonia odor that’s oh-so-common in pet urine. It’s also practically dust free which means a cleaner environment as well as lower chance of respiratory issues or aggravated allergies. Another great thing about this bedding is that it’s made from reclaimed wood pulp. The size and texture are perfect to encourage your rabbit to play and burrow. Plus, because it’s all natural, it’s also biodegradable and compostable after use. 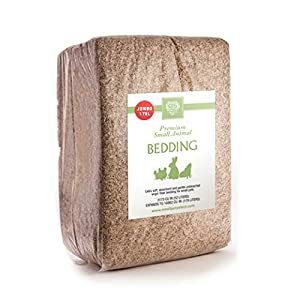 While we stand behind our reviews of all the products we recommend, we think Small Pet Select Premium Soft Paper Bedding is the best one we found. This 100% natural bedding is made of soft paper that’s the perfect size and texture to encourage your rabbit to play and dig. It won’t be hard on paws and creates minimal dust and mess. It’s also really absorbent and expands up to 3 times in volume. This helps your pet stay dry and controls smells so you and your rabbit can live in a home that’s odor free. We love that this product was developed by pet owners who wanted to find better bedding for their pet and trust that they had their pet’s best interest at heart. When it comes to rabbit bedding, there are a lot of really great options as well as a few really bad ones. Let’s take a closer look what you should and shouldn’t use. Paper based bedding is one of the best kinds which is why all of our top picks are, in fact, paper based beddings. This kind of bedding is made from natural cellulose fibers and can even be made from 100% recycled materials. It’s usually the color of cardboard but may have some flecks of color depending on the source material. There’s a lot to love about paper based bedding. It’s safe for rabbits and other small animals and won’t stick to fur. It’s also extremely absorbent and really good at controlling odor. Some paper based bedding comes in small shreds while others are in small pellet form. Another thing that’s great about paper based bedding is that some brands are biodegradable and can even be used as compost. Obviously, this is a really environmentally friendly option. You probably see pine and cedar shavings in pet stores all the time but, believe it or not, neither of these is good for rabbit bedding. They can actually cause respiratory issues and liver damage though you can still find them for sale. Wood shavings tend to be rather inexpensive, however, so a lot of pet owners might be drawn to them. If you have to use wood shavings, go for aspen which is safe for rabbits. There are good and bad sides to wood shavings. While they’re very absorbent, they don’t really do anything to control odor. They’re messy, too, because they easily get stuck to your rabbit’s fur and then tracked around their cage or your living room. Straw isn’t a particularly good bedding for indoors. It’s not very absorbent and can make a pretty big mess. That said, if you keep your rabbit in a hutch outside, straw is a great material to use for insulation. Plus, rabbits love to snack of straw so it will give them a little extra treat when they’re outside. This is one of the cheapest options, especially if you still get newspapers delivered to your house and aren’t sure what to do with them after you’ve read them. Some people like this option but keep in mind that it doesn’t control odors well and will need to be replaced often. Shredding newspaper seems like a good idea, but it can actually be quite dangerous. If your rabbit likes to chew on its shredded paper bedding, it can ingest too much which can actually cause a blockage in its intestines. This can be a medical emergency and can even be fatal. A great way to use newspaper is to put it under another bedding as a base layer. 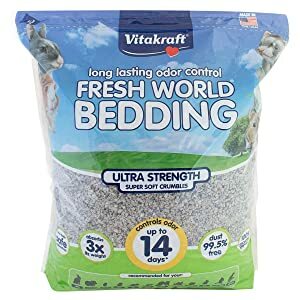 It adds an extra layer of absorption and can make it a little easier to change the bedding if you lay it in the base of the litter box without shredding. if you choose this route, make sure that it is always covered by another type of material so that your rabbit can’t chew it. Cat litter should never be used for rabbits, even if you have a rabbit who’s litter trained. There are a few reasons for this. First of all, cat litter can be dusty, which can cause respiratory issues for your rabbit or anyone in your home with allergies or asthma. Secondly, if cat litter is accidentally ingested by your rabbit, it can clump up in their digestive system and cause a lot of complications, possibly even death. Choosing the right bedding for your rabbit is one of the most important decisions you’ll make. There’s a lot to think about. The best bedding will make both you and your pet happy. Make sure you choose something that is absorbent and can control odors. All of our top products are extremely absorbent and can soak up about three times their own volume. The bedding should be comfortable for your rabbit’s feet and a nice, fluffy texture that encourages them to play and run around. We recommend choosing an all-natural paper based product like Small Pet Select Premium Soft Paper Bedding. We love that it was developed by a pet owner who wanted to find a better option for bedding that was gentle on a pet guinea pig’s paws. It’s absorbent, controls odors, and is 100% natural.